I know that this problem has been discussed a number of times on the nmrPipe newsgroup and there are some helpful hints (especially here), but some details seem to be missing. 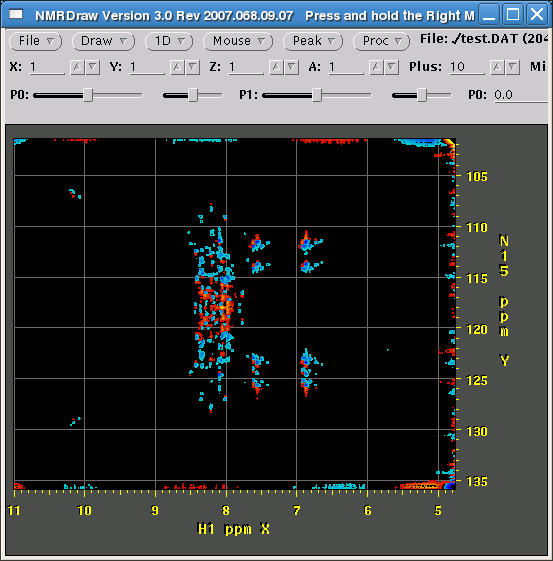 everything else is the same as in standard hsqc processing and below is the picture that we get in nmrDraw. Sign of the 15N frequency is not discriminated. Any help will be appreciated! This question might have been better posted in the NMRPipe group. In an interleaved version of the gradient-enhanced data, there are two possible formats. In the case array="phase,IPAP", the innermost acquisition loop is the Rance-Kay phase encoding. So, adjacent pairs of vectors are Rance-Kay pairs, and you can convert this data with "-yMODE Rance-Kay". Then, later processing steps can use COADD to select or combine channels. I found a post post from Frank Delaglio on the NMRPipe message board that answers the same question, but I think there was a confusion about ordering of the IP/AP loop with respect to the quadrature frequency discrimination loop. This solution worked for the setup where array='IPAP,phase'. For the opposite setup, try Frank's post. Then calculate the final separated spectra.